At Cunnington Farms we breed & raise sheep for even temperaments, great mothering ability, effortless lambing and “easy keeping”. Our main focus is correct breeding stock and their lambs, which is also our major product. We also sell a wide variety of high quality Roving, Yarn and Finished Wool Products, as well as Navajo Rugs. We have used a number of different mills to achieve the quality of product we offer. Our mill now is Mystic Pines of Arizona because it uses no chemicals in the production of their product. We do not raise any of our sheep specifically for meat, although many of our breeds are duo-purpose sheep. However, the purebred sheep from our flocks that mature to be unregisterable in their breed can be sold for meat and often are, as all of our breeds have mild, excellent-tasting meat. We only sell meat live-weight. There is a USDA processing plant within an hour of our farm. Navajo-Churro, Tunis and CVM are classified endangered livestock by The Livestock Conservancy. We sell Navajo-Churro, Tunis and CVM as Registered or Registrable Breeding Stock. We also have crossbreeds of other breeds of sheep, such as California Red, Cotswold, Corriedale, Shetland, Cheviot and Painted Desert and sell them solely as non-registered sheep, suitable for a spinner’s flock. 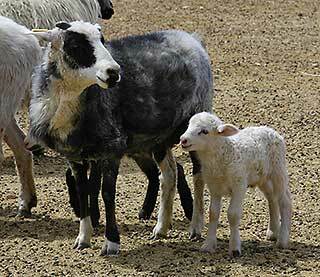 To achieve our unique mixed breed sheep we have registered animals from all the breeds we use as breeding stock, so our initial crosses have predictable characteristics. We specialize in top quality mixed-breeds to produce high quality, unique spinners fleece. While we wholly endorse the fact that pure-bred, registered sheep have identifiable characteristics and need to be bred to exhibit those characteristics, we have come to believe that a mixed-breed spinners flock has a useful place as well. Fleece from a carefully bred mix is unique to those animals and usually cannot be achieved by mixing several different animals’ fleeces after shearing. All Cunnington Farms mixed-breed sheep and the fleece they produce are clearly identified as mixed. We have spent twenty years selecting which breeds we feel consistently produce easy-keeping, good mothering, healthy ewes, and virile, good natured rams, as well as babies who have lovely fleece while retaining their desirable sheep traits. At Cunnington Farms, we care about the ongoing well being of our sheep. We encourage interested sheep people, and buyers of our sheep to spend as much time talking to us, and learning about the care of sheep, as they need. We have an educational program for first-time sheep owners. We have recreational vehicles parked in our farmyard, and overnighters are welcome, if they feel a single day with the sheep is not enough for them to feel comfortable taking sheep home without more education and communication. 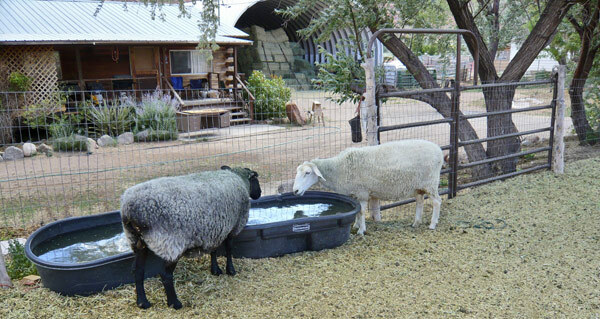 As Moab is a destination resort town, and motels are expensive, staying on the farm with us is a good alternative. We want everyone who purchases our sheep to feel that they are going home with all their questions answered. We also welcome people to stay in touch with us for any subsequent questions and problem-solving. The National Tunis Sheep Registry, Inc.